The BearAcade™ products line is dedicated to improving the abatement of noxious materials by bringing new technology and methods that result in improved isolation containments. A new way of building containments has been developed to address both the quality and lower overall costs. New materials consisting of adhesives that are removable but have the holding power to provide containments that will not fail, and methods of building containments, including applicators that can deliver ten times the average square foot per man hour have been developed. This new system, "The BearAcade™ Way" has provided some contractors the ability to double their business and deliver improved containments to their customers. 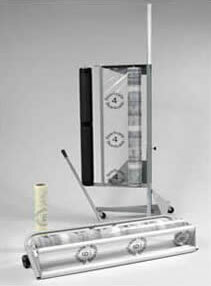 "The BearAcade™ Way" was developed and tested by abatement contractors to insure real world performance on the job. 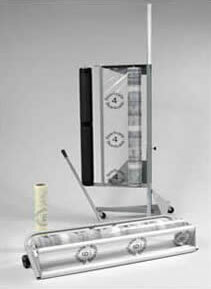 BearAcade is a self-adhering sticky poly sheeting film. It is dedicated to improving safety, increasing speed and lowering cost in the abatement fields. • Eliminate “billowing” from wall and floors. Improves vision within the containment, eliminates accidental snagging of the billowing film with tools or equipment, and floors are less slippery than “billowed” floors. 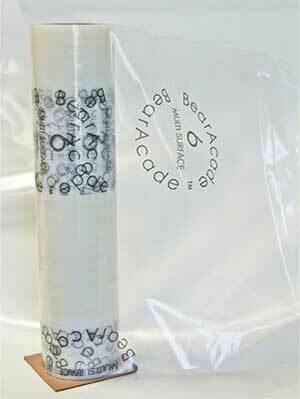 • “The BearAcade Way™” was developed and tested by abatement contractors to insure real world performance. With this floor applicator, contractors can apply BearAcade; utilizing the applicators 9-10x’s as fast as the traditional method. For instance, many contractors average 350 sq. ft. an hour for walls and floors hanging poly with duct tape and spray glue. With BearAcade™ that number increases to 3500 sq. ft. an hour. With this wall applicator, contractors can apply BearAcade; utilizing the applicators 9-10x’s as fast as the traditional method. For instance, many contractors average 350 sq. ft. an hour for walls and floors hanging poly with duct tape and spray glue. With BearAcade™ that number increases to 3500 sq. ft. an hour.